So I'm going to write about something that I've built in the last week, because I've been looking at a simple Todo app - and Flow has started to really streamline the way I work. I don't really want to get into why I choose Todo instead of Wunderlist or Todolist or Google Keep. I think I just want a really simple Todo app that I'll complete every day. 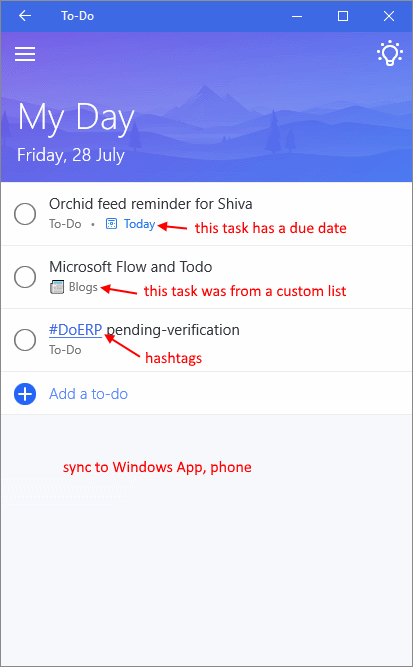 Hit suggestions, and it shows you tasks from three categories that you can add to "today"
But it sync with Outlook Tasks - which gives me the idea for this Flow. (Actually, I'm pretty sure Todo just uses Outlook Tasks as the source). Calculate today - NOTE don't include quotes " and "
And we see this in Todo, almost instantly. I now have a web service that takes a simple JSON and I can add tasks anywhere into my Todo. I'm playing with the idea that different Flows can put tasks into this API, which will populate tasks that I can add into "today". I'm also thinking to create different lists for different sources, and watch task changes to write back to source system. That will make this a really good end to end solution for me.